CLTS is not afraid of stealing a good idea! With thanks to our sister seminary in Edmonton, we have inaugurated our own “Take Wing” programme, designed to give second-year seminary students an experience in a parish more distant from the seminary than our usual field work, and to give them personal contact with the seminary. Matthew Fenn recently launched the programme with a weekend in Winnipeg. Rev. Cameron Schnarr, pastor of Beautiful Savior Lutheran Church, Winnipeg, and a member of the seminary’s Board of Regents, arranged for Matthew to lodge with the Roberts family, who, he reports, were amazing hosts! They discussed Lutheran hymnody, theology, seminary education, and the like. On the Sunday, 25 June, Rev. Schnarr put Matthew to work! He assisted in the Divine Service that morning. He also had the chance to teach a Bible Class on Jehovah’s Witnesses. Being a former JW himself, Matthew was uniquely qualified to give an insider’s perspective to the group. He talked about the history and origin of the JWs. He also talked about their theology and beliefs, especially as they contrasted with the faith of the universal Christian Church. He was also able to present an effective tactic to use when in conversation with them. The class was enthusiastically received and there was not even enough time to field all the questions! They especially liked hearing of Matthew’s own conversion, and how he found himself in the Lutheran Church and then in seminary. Matthew got the chance to serve again at a special afternoon service commemorating the Presentation of the Augsburg Confession. 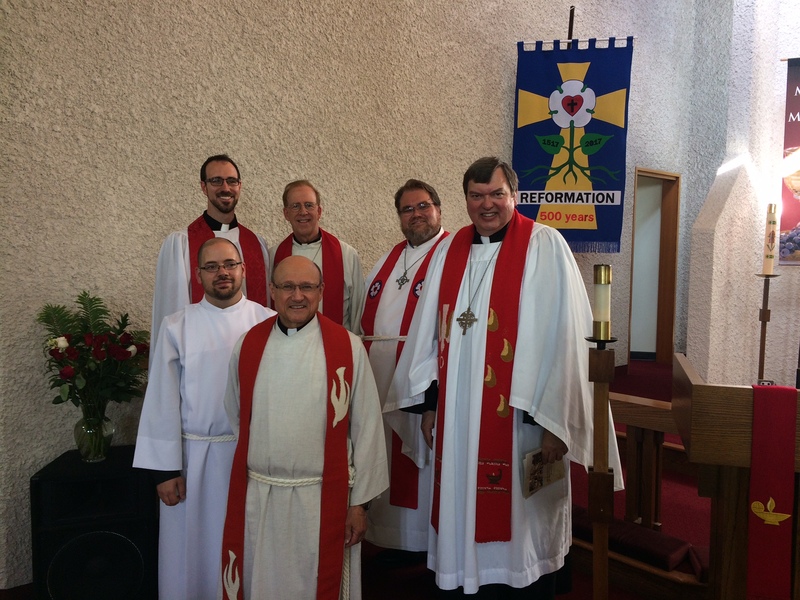 Area pastors and the District President (Rev. Tom Prachar) were in attendance. Pastor Prachar preached a fine sermon on Psalm 119:46, “I will also speak of your testimonies before kings and shall not be put to shame”, a fitting text for the occasion. Matthew served as crucifer. “I loved serving as crucifer,” Matthew said. “It is a position I don’t often get the chance to perform.” Along with this, he also read the bids to the bidding prayer. note typo: should be Psalm 119:46 (not v56). Reformation 500 Conference, 10-11 September 2017: Registration Now Open!